USAA announces the 10 best places to retire for military families, based on the results of a study conducted in conjunction with Military.com and Sperling's Best Places. This first-of-its-kind ranking is another step by industry-leader USAA to expand the arsenal of tools it uses to assist its military members with retirement planning. The study took into consideration such factors as affordability, housing costs, unemployment rate, and proximity to military installations and VA medical facilities, among others. Another factor was whether military retirement pay is subject to state income taxation. Military retirees, on average, retire in their mid-forties and embark on a new career. They continue to raise families while pursuing a second career, either by working for another employer or starting their own businesses. So they generally also plan a second retirement from their civilian job. As of 2009, there were approximately two million military retirees in the US. We were surprised to see some of the cities included on the list as best places to retire, and some places that we expected to see weren't there. Are there surprises for you on this list? On their web site, USAA lists detailed information about each of the cities included on the list. 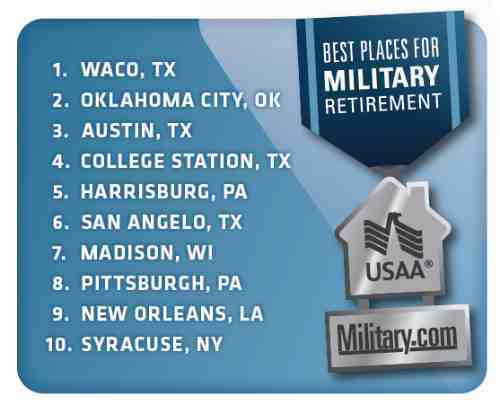 In addition to this list, USAA and Military.com also created lists of the top 10 best places to retire in large, medium, small and "military" metro areas. Some of the cities we expected to see on the list were likely excluded due to cost of living. The study excluded metro areas where the median housing cost was 40 percent above the national median. As you begin to think about retirement planning, USAA offers a variety of financial and investment resources to assist you, including certified financial planners. And unlike most financial planners, USAA's financial planners are not compensated on a commission basis, so you needn't worry about them pushing investments that are not right for you, just so they make a bigger commission. Call and schedule your free consultation with one of USAA's knowledgeable financial planners. If you're not yet a USAA member, what are you waiting for? Membership was recently opened to all those who have honorably served, at any time. So if you weren't eligible before, you will be now, as long as you were retired or discharged under other than dishonorable conditions. And when you get ready to buy your next car or home, don't forget to check out USAA Auto Circle and USAA Home Circle. You can research, buy, finance and insure your car or your home with your smart phone! Return to top of Best Places to Retire.